Locking Shelving Cabinet - Business & Mfg. Franklin mills offers a premium line of lockable storage cabinets. Our unique retractable door system provides selective security where and when you need it. 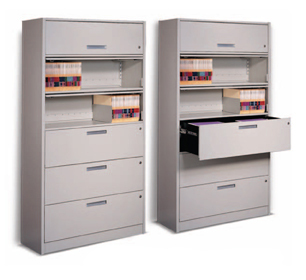 Our cabinets are available in 30", 36" and 42" widths and are designed to be used with letter size end tab folders. Contact the experts at Franklin Mills to discuss lockable shelving systems for your facility at 1-888-678-4585.